The birth of tango was very clearly the product of the country’s peculiar immigration pattern which had its first big boom in the late 1800´s. After Rosas downfall in the Caseros battle in 1852 a new constitution was formed in which immigration was encouraged by offering benefits to foreigners who would populate the land and serve as qualified labor, introducing science and art into the culture. Contrary however to the governments expectation, the immigration that arrived was mostly poor and uninstructed and populated the city, rather than spreading out to the rural areas where the country most needed labor. To counteract this effect, president Avellaneda passed an immigration and land law that guaranteed the distribution of small parcels of land to immigrants. This served the additional purpose of preventing the formation of large estates belonging to a select few. The measure however didn’t play out as expected given that the large Patagonia area taken from the indigenous people in the Conquest of the Desert, ended up belonging to a few owners who became very powerful. Although there were many job opportunities in agriculture, the opportunity for land ownership was no longer there. This became a source of frustration for the immigrants who had come expecting their own piece of land. In return, they stayed in the city periphery living a life of poverty, despair and nostalgia, and constantly in touch with immigrants from other cultures who they coexisted with in the crowded conventillos. The combination of these feelings of uprooting and loss present in the new society combined with the cultural mixture that was beginning to take place is at the root of tango. The cries of the Andalusian tango (a branch of flamenco), combined with the Cuban habanera, the schottische, the local folkloric music and African candombe came together in one of the most distinctive music genres of Argentina. With its unique language (lunfardo) and its recurrent themes of the arrabal (neighborhood), disillusion and loss, time, sensuality and sadness, it has become a reflection of the characteristic nostalgic local identity. 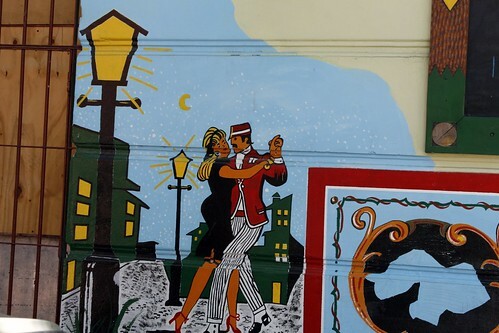 This entry was posted in Argentine Culture, History and tagged argentina, buenos aires,, dance, History,, immigration, music, Tango, Travel by Fierro Hotel Staff. Bookmark the permalink.